You won't find books about cannabis or marijuana in bookstores, but you can find them at Dutch-Headshop. The books are a source of information and provide you tips on cannabis and CBD oil; perhaps this is the best investment you can make. Learn how to grow cannabis yourself with this selection of informative books and DVDs that contain background information about marijuana and cannabis. The books and DVDs serve as a source of information. 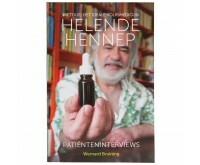 Take for example the book "Healing Hemp" by marijuana trailblazer Wernard Bruining. This 320-page book is divided into two interesting parts. The first part tells about cannabis as a folk medicine for the future, in which everyday people, with terrible disorders such as osteoarthritis, autism and schizophrenia, share their experiences on the use of marijuana and CBD oil as a medicine. In the second part, the author describes the unjustified ban on cannabis extensively and substantiated, followed by tips on how to make cannabis oil at home. Such a wealth of information you won't find in the bookstore or the largest Dutch online bookshop, but simply here, at the Dutch-Headshop. This information may be the very best investment you can make to increase your garden's yield.